Books are heavy to take on holiday. 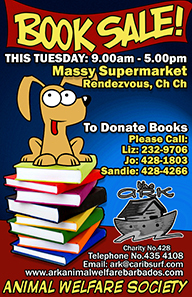 In Barbados, on the first Tuesday of every month, is The Ark Animal Welfare Society book sale outside the Big B supermarket at Worthing. The books are 4 or 5 BBD - read then donate back next month is a good idea.